K – Good morning Widodo. W – Good morning Mr Author. K – You can call me Kenton, if you like. W – I’m a very polite marsupial. K – I’m sure you are. But Mr Author sounds weird. Kenton will be fine. W – If you say so. OK. Let’s get started then. When did you first discover my magnificent species, the tree kangaroo? K – I thought I was meant to be interviewing you? W – If people want to learn about me, they can read my book. I thought it was very good by-the-way. W – Yes, though there could have been a little more about tree kangaroos in it. K – Really? It’s nice to read about other animals too – cassowaries, sea turtles, dugongs. Besides, there was quite a lot about you in there. W – Perhaps. I won’t mention it again. Anyway, when did you first discover tree kangaroos? K – I saw them at Taronga Zoo one day. In Sydney. W – Oh yes! Cousins of mine. W – Yes, they’re a different type of tree kangaroo from me. They’re Goodfellow’s tree kangaroos. Actually pretty common. W – Common enough compared to me. I’m very rare, you see. I’m a Golden-mantled tree kangaroo. About as rare as a tree kangaroo can be. K – Where would I go to see a Golden-mantled tree kangaroo, Widodo? W – Well, no zoo on Earth has one of us on display. So you’d have to go to the island of New Guinea where you’ll find us in two patches of forest in the cloud forest overlooking the Bismarck Sea – one in Papua New Guinea and the other in Irian Jaya. Personally, I’m from Irian Jaya. K – I knew that, in fact. Do you want to know how I knew that? W – You have magic powers? K – Yes, I do (smiles). But I mean, do you know how someone reading your book can tell you’re from from Irian Jaya? W – It’s the batik patterns and the houses on the beach. They look like the ones near where I live. 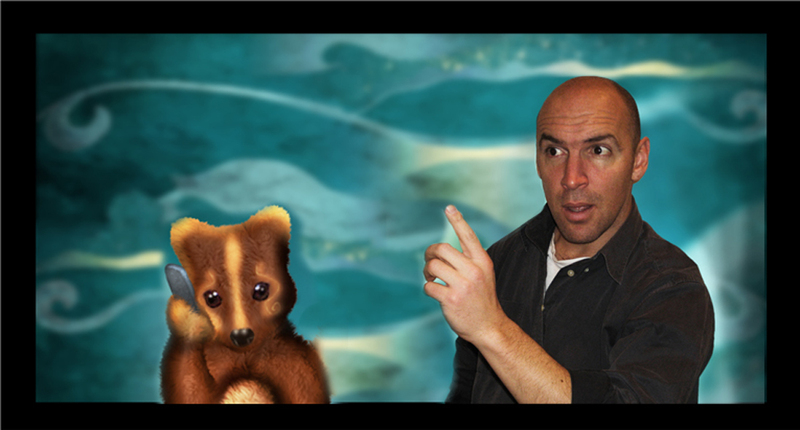 W – And the tree kangaroos in your story that live across the river are Grizzled tree kangaroos. They live near me. They’ve got black fur with white fluffy collars. Nice enough fellows but not as beautiful as my type. IMHO. W – IMHO means ‘In My Humble Opinion’. K – Yes, I know what it means. I just didn’t think you’d know that kind of language. That’s pretty cool. W – I’ve got my own Twitter account too. And lots of followers. More than any other tree kangaroo I’d bet. LOL. K – Yes, LOL, Widodo.